Funnel cake, the midway, 4-H competitions, deep-fried Twinkies on a stick and cyclocross. All staples of the state fair. At least they will be if Ken Getchell, promoter of SpectaCross, has his way. 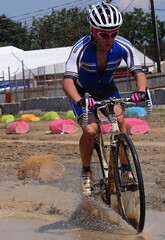 The SpectaCross cyclocross races took place July 31 and August 1 at the New Jersey State Fair. Although fields were smaller than expected, the event was professionally run and featured a fun, tight course. We caught up with five participants to get their thoughts on the weekend. CXHairs: Give your impressions of the event. Atmosphere, crowds, how well was it run, fun course? Jared Nieters (Haymarket Bicycles): I raced at the NJ State Fair a few years ago and it was a lot of fun. There is a nice little demolition derby arena and plenty of curious onlookers. Since it’s a bit out of season, the crowds and fields weren’t huge, but it was great. Everything was really well-run. The course was great, though the torrential rain on Friday made the course a lot more messy that I was prepared for. It meant that I was scrambling to fix my bike before Saturday’s Elite race. I had to run new der. cables in the morning because there was all sorts of muck in the housing. Arley Kemmerer (Hub Racing): The event was much better than I was expecting (don’t tell Ken!).[ed. note: Too late.] I was worried the course would be super short, but it turned out to be a great course. Crowds were small, but I did speak with a few spectators before and after the race who found the race really exciting. When I thanked one couple for checking the race out, the woman responded “it was my pleasure!”. Atmosphere was the same old cyclocross style, laid back and fun. Chris Mayhew (JBV Coaching): The atmosphere was pretty good. There weren’t a lot of people but everyone was enthusiastic. The event was very well run, which was nice. The course was really awesome. Really I think a short course works better so early in the season versus a long eight minute lap where you could really dig yourself a hole. Beth Mason. Photo Courtesy of Demon Cats Photography. 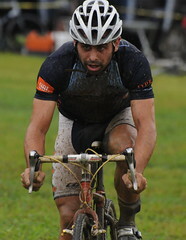 CXHairs: How much cross-specific training did you do leading up to the weekend? Did your training change at all for this race going from road to CX? Did you do many CX-specific drills? Jared Nieters. Photo couresty of Demon Cats Photography. Jared Nieters: I haven’t been doing too much cross-specific training yet. I am prepared for crits—I’m still focused on the USA Crits series, with Presbyterian coming up this weekend—but that type of fitness lends itself perfectly to cross.I’ve done a few mountain bike races for the first time in a while, netting a first, second, and third in three races, so my confidence on the dirt is high. I’ve have taken the ‘cross bike to the mountain bike trails three or four times with Joe Dombrowski, and we’re starting weekly ‘cross rides from the shop here in Haymarket every Thursday. Beth Mason: I did no training leading up to this (oh yeah, it showed). Ok, I did one day of “starts” last week. My start was pretty good. After that it was pretty much downhill! Ryan Dudek: Well, I don’t race road, so I guess no? I have done a couple of mountain bike races lately, and have an 18 hour race coming up in 2 weeks, so really I’ve just been out mountain biking on the weekends and trying to find time to do workouts after I get out of work during the week. I try to play polo at least once a week, so that’s a decent work out, and it helps with balance and stuff, but it’s not the same kind of effort. I dunno man, I guess I’m just a kid having fun on his bike. Chris Mayhew: None at all. Besides pulling the trailer around I’ve barely been on my ‘cross bike. I was mainly hoping 10 years of experience was going to keep me out of trouble. I took an easier week (coach’s orders) but other than that nothing different. Arley Kemmerer: I did NOTHING to prep for this race, aside from take a spin on my bikes the evening before for about 20 minutes to make sure they weren’t falling apart. My road schedule keeps me pretty busy, so no time for playing in the mud just yet! CXHairs: Describe the course. Any interesting or unique features? Jared Nieters: The course was notably short, and without long and really long stretches (which I would have liked, so I could have increased the speed a bit). There were countless sharp corners and a few muddy spots which really seemed to define the course. Beth Mason: On Friday the course was slick with about 300 hairpin turns and mud puddles that went up to my knees. On Saturday the course started out pretty tacky and sticky, but turned out to be pretty blazingly fast as the day wore on, but held some of the slop on the corners to make for some interesting spectating. Chris Mayhew: Very very tight. 3 min laps and I think the most you were every fully on the gas was 20 seconds. The corners were a ton of fun, especially as the course changed during the day. I was really looking forward to the car run over but storms the day before put the kibosh on that. Ryan Dudek. Photo courtesy of Demon Cats Photography. Ryan Dudek: Completely flat, except there were two dirt mounds, one of which you went over twice.A good amount of turns kept things interesting, and I was super lucky that it rained on Friday, otherwise I think it would have just been a dirt crit with two wooden planks you have to run over. Meh. I dunno, the course was cool. They definitely did a great job with what they had. I was pretty bummed about the car not happening though. I understand why it didn’t, but that would have been rad. Arley Kemmerer: It was super technical, lots of sharp turns and corners, and of course, lots of mud on Friday. It was good to ride a really technical course like that to freshen up the bike handling. CXHairs: How did the race unfold? Any key moments? Jared Nieters: I started poorly, not clipping in quickly, and entered the arena around 10th. I hammered up to second on the first lap and settled in on Donahue’s wheel. We slowly rode away from everyone, except Johnny Bold. After a bit, I attacked after the finish line to see how the others were feeling, Bold came with me, and Donahue settled into his own pace. Bold and I rode together for about 40 minutes, taking turns leading. I was gapping him out on the straight sections, but he was catching me in the muddy corners. I attacked him a few times, but he never cracked. I let him come by for a few laps to learn his lines, but it didn’t really speed me up to much when I re-took the lead. Donahue caught up with about 3 to go and I attacked when he made contact. On the last lap Donahue bumped me hard and took the lead shortly before the barriers, and I returned the favor in the next corner. I maintained the lead until the second to last corner, which was where the race was decided. I was in the middle of the only real dry line, Donahue came up on my inside and made some solid contact, and I was forced wide into some mud. It was a good move on his part, I left the door open on my inside, condemning myself to a frustrating second. Ryan Dudek: It just did. I have no idea what was happening on Friday. But on Saturday, Chris Mayhew blew away the whole field. Chris attacked and it really became many separate races within the first 3 laps. There was a race for second and third. There was a race for fifth through ninth, and then I don’t know what was happening behind that. I did see some guys working really well together trying to bridge the gap I had on them. That is always awesome to see in cross. Chris Mayhew: That race was entirely about the start. There was little to no passing for large parts of the course. I was able to block for a Western PA “teammate” (piranhas don’t eat each other) pretty easily after he won the start. 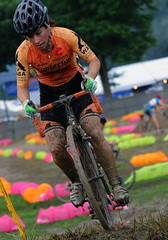 Arley Kemmerer: Friday’s race didn’t work out so well for me, I lost a crank arm about three laps in just past the pit, and really didn’t feel like running a whole lap in the mud. I pitted, fixed the bike, then jumped back in for a few more laps for practice. Saturday’s race was much better, the course suited me really well. I like technical fast courses. Dee Dee Winfield and I rode together the whole time. I sat on her wheel to let her do the pace-setting, and had planned to attack on the last lap past the pit, but she accelerated in anticipation of that, so I had to settle for 2nd. There really wasn’t anywhere to pass beyond that point, but it would have been really exciting if it came down to a sprint finish. Who knows what would have happened then! CXHairs: What was your pre-race routine? Food? Warm-up? Jared Nieters I didn’t know what time I was racing on Saturday, so I got to the venue early just to check out the fair. It turned out I was racing earlier than I had anticipated, so I had to hustle to change my brake pads and string new shift cables. I poked around on the roads for about 30 minutes and did a few sprints to open up my legs. I ate breakfast at the Holiday Inn Express. My room was expensive, so I ate a ton and took as much food as I could smuggle out of the place to get my money’s worth. Beth Mason: Absolutely no warm-up. Food was a banana about an hour before, and my normal pre-race paleo smoothie about three hours prior. My nutrition was fine, it was everything else that needed work! Ryan Dudek: Powered by holushki! Don’t tell anybody about my secret, but holushki, an Eastern European dish of basically spice and butter covered noodles and cabbage, is key. I ate three or four servings at the fair. There was an awesome Slovak vendor making pierogie, holushki, and golumpki. I don’t know what Slovaks call golumpki, I am Polish. Its cabbage stuffed with rice and beef. [ed. note: The Slovak term for golumpki is Holubky, of course.] I ate there almost every time that I ate. It was right where they were having the beef obstacle course and the cow shows and stuff. Also near the rooster tent and the clean bathrooms. Chris Mayhew: A nice leisurely breakfast at the hotel, sit in traffic for half an hour and then forget to eat or put my timing chip on. Way to spaz out, coach. Really it went smoothly but it was nice to have a dry run before Charm City. Warm up was just doing half an hour on the course. Again, the shorter course meant less time needed for recon, which was nice. Arley Kemmerer: Can’t eat much before a cross race, or else it will be all over the course, so I go light on the food pre-race. Did a bunch of laps on the course, then jumped on the trainer for 40 mins or so. I felt like I needed a longer warm-up because my legs weren’t used to the violent effort right from the gun. CXHairs: It looked muddy. What wheels and tires did you run? Jared Nieters I rode Zipp 202s with Challenge Grifos. Because the course was smooth, I ran then at 25psi. It was a little too low because I was folding them in a few of the corners. Fortunately, Chris Hayes did a great job gluing them, because if they were going to roll, it would have been in that scenario. Beth Mason: I love my Reynolds DV Cross wheels and my Challenge Fango tires! Ryan Dudek: Oh, I don’t know. Whatever Matt Bartlett (Toms Shoes) let me borrow. They were his old bikepolo wheels. Something like 36h 3x Surly hub to Velocity Deep V (SO TARCK) with some cheap tires off of Chain Love, I think Hutchinson Bulldog 34s? That sounds about right. Chris Mayhew: Saturday wasn’t all that muddy and dried out as they day went on. I ran the only tires I have, Challenge Grifos. My main concession was to run lower pressure, 28psi, than I might otherwise. Traction was iffy and the dry parts were really bumpy. Arley Kemmerer: My Cosmic Carbone clinchers are still on my road bike—I have a few more road races to go in the season—so I ran clincher Ksyrium SLs. CXHairs: Did you bring a pit bike or wheels? Did you need to make a change? Jared Nieters I brought a pit bike but never touched it. Beth Mason: I have a pit bike, but I didn’t bring it. Ryan Dudek: Ha ha! I didn’t even bring MY OWN bike. I borrowed a bike from a teammate since I am currently without a frame. But don’t worry, it should be ready before Nittany Lion. Chris Mayhew: I brought wheels simply because I had them but I’m still rebuilding the pit bike. Knowing what I know now I think you’d be hard pressed to make a change and get back in the running although Alex Donahue might disagree with that. He crashed and then won! Arley Kemmerer: Yes, pit bike. I didn’t want to pit on Saturday despite having a bum rear shifter because I didn’t want to lose any time. CXHairs: Any crashes or close calls? Jared Nieters The bike came loose in a number of the corners because of the mud. I tried to keep it right on that line between fast and falling. I never hit the deck, though. Beth Mason: Many close calls, but surprisingly only one crash when I didn’t quite unclip prior to the barriers. Fun stuff! Ryan Dudek: Oh, I wiped out once Friday night. I was trying to catch Chris Jensen from Chicago, and I took it too hot on a semi-flat wheel around a corner. My bibs rolled up a good 5 or 6 inches on my right leg. I’m sure I looked classy. Chris Mayhew: No crashes on my part. That course was an object lesson in “fast is slow, slow is smooth, smooth is fast”. One guy did try to pass me in the 180 turn (hint: bad idea) but luckily he kept it more or less upright. One lap I did land really poorly off the jump, which was a scary moment. Arley Kemmerer: Nah, I’m very graceful! CXHairs: Will you go back next year? Jared Nieters I plan on returning. Beth Mason: If I’m not in Iraq or Kentucky, I will be back! Chris Mayhew: We’ll see. It was a great course but I’m conflicted about supporting promoters that don’t keep promises. CXHairs: Anything you would like to add? Jared Nieters I think Ken Getchell and Beth Mason did an excellent job putting the event together. They seem to have some great media coverage and chip timing which allowed people to follow the race live online. Beth Mason: My experiences as race director were great. I have never been a race director before, and I’m really glad Ken gave me the opportunity to get to do this. The riders were fun to work with, and seemed to be having a blast, even as they suffered out there! I learned that high fives to the race director are status quo (as I hung one racer out to dry as he offered me his hand as he rode by…I looked at him strangely, I thought he was looking for a lap count, or for a beer hand up or something…I got in on the game later on in that race and hit him with a fiver as he passed.). I really enjoyed experiencing a day of cyclocross from the other side of the barriers, so to speak. Ken put on a great race, and I know he worked really hard to make everything just right. He put together a great crew of workers to include his wife and kids, Eric Mitchell on the The All Sports Events Timing and Event Services really made this event run like butter. They made everybody’s job so much easier. Ryan Dudek: Hmm. It was awesome to see the Poppers and Chris Jensen for the second weekend in a row. Thanks for coming all the way out from Chicago! I miss those kids a whole bunch. Oh, and it was great to see the Adventures for the Cure boys again. Thanks for yelling my name at me Pat! Chris Mayhew: It was a good time and having a ‘cross race in the middle of road season brought into stark relief how much nicer and more pleasant the ‘cross scene is. Shout out to total stranger Jess who handed up bottles and screamed her head off my entire race.